Bunds Drop, Euro Rises As Draghi "Not Dovish Enough"
Ahead of Draghi's press conference, some traders had hoped that Draghi would acknowledge the sharp slowdown in the European economy in recent weeks, as shown by the latest drop in the Citi Eurozone surprise index, the ongoing political turmoil in Italy and the UK, and general economic slowdown due to the ongoing trade war, perhaps going so far as hinting at an extension of the ECB's QE. And while the ECB president did acknowledge a "somewhat weaker moment", citing Brexit, trade and Italy as the key risks, offsetting this was the assessment that risks to growth are still "broadly balanced" while noting that there still is a broad-based expansion and remarking that the ECB has "no reason to doubt our confidence in inflation" has rendered Draghi's commentary "not dovish enough"
Furthermore, as Bloomberg notes, the key to the Draghi's thinking is that the slowdown is due to 'country-specific factors' "idiosyncratic reasons" as he mentions the German auto sector as well as trade and political uncertainties (Italy/Brexit). The fact that the ECB sees these as temporary factors means that there's no plans - for now - to reverse on QE's December end-date. 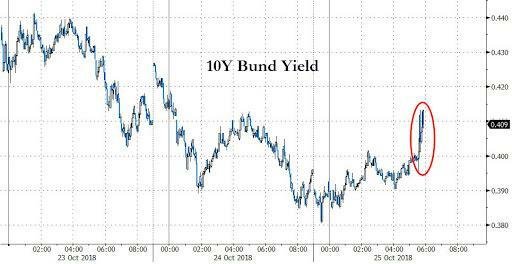 ... alongside Bund yields which are also several basis points higher.